Clothes can be a signature, a conscious choice as part of one's brand. Clothes can also be armor, a shield against unwanted attention or criticism. For women, fashion can be a touchy subject, one emotionally charged, as fashion -- a subject often scoffed at -- is inseparable from body image and society's defined gender roles. I've written and rewritten this post a dozen times since believing a version of it needed to be told in October. It's not another post about the outfits a blogger selected to wear at Alt. And yet, it is, based on its timing, finally published the week after my trip out to Salt Lake City. While about clothes, this post is about becoming comfortable in one's own skin and having (regaining) the confidence to forgo trends and trying to match others' ideas of beauty. What's your relationship with clothes? To say I've had a rocky relationship with fashion is an understatement. I've often felt guilty for spending money on clothing that was feminine and flattering, believing I would be seen by colleagues as frivolous and self-absorbed. When complimented on my attire, I'd play it off, not wanting anyone to think I actually spent time picking out what I was wearing or how it was accessorized. Growing up I embraced color and bold patterns. I chose fabrics and trims and consulted with my mom about design changes that needed to be made to stock patterns. I was fearless. I was bold. I was me. And then bit by bit, pattern by pattern, color by color, as years passed, with each backhanded compliment or snide remark, I retreated into the shadows. I internalized what others said. I became ashamed and embarrassed of my hourglass figure. Curves I had no choice in accepting that propelled me from being seen as a child of 12 to a pinup almost overnight. I was compared to Elizabeth Taylor in Cat on a Hot Tin Roof. I didn't look my age, I was told I needed to alert male colleagues. Like them, I agreed my curves needed to be hidden -- that I had a responsibility to society to dress "appropriately." During school hours from elementary school through high school, fashion wasn't in my control. I wore the dictated pleated plaid skirt with a white blouse with Peter Pan collar and blue cardigan. The three differences were that the plaid was red for the first six years and then blue; the shirt collars went from rounded to button down; and the sweaters were eventually pullovers. We had some freedom with our shoes, but not much. Peers didn't really see what we wore outside of school. The highlight of school days were spirit days and days where we could choose our attire. In elementary school, I loved Halloween and spirit days, working with my mom to perfect my outfit from head to toe. By the time I was in junior high, I dreaded free dress days. My yearly jacket choices were too childish (I had a quilted patchwork jacket with corduroy hood that I loved) or too outdated (I had a camel colored, slim-fit, three-quarters length wool princess coat with hood edged with faux fur). In eighth grade, we had a whole week of free dress as a graduation reward. My mom and scoured the local malls trying to find clothing that fit (my curves meant I couldn't wear anything from the children's section and the Juniors section was stocked with Flashdance inspired attire) and looked like what others were wearing. I ended up with a pair of blue cords, my first jeans, two polo shirts, a pair of sailor shorts, and a handmade 1950s-inspired wiggle dress. With the exception of the sailor shorts outfit (that I loved), I fit in--I looked like everyone else. I was teased mercilessly for the sailor shorts--they were too long; they were more like a skirt. I don't remember the top I wore with them, I only remember that they flared and hid my hips. I felt dainty and feminine. In junior high and high school, I first volunteered at The California Academy of Science and The Archdiocese of San Francisco, and then worked in the mail room of The Archdiocese of San Francisco and Sotheby's Realty. I had a limited budget for clothing outside my school uniform and my wardrobe had to accommodate a professional work environment as well as school activities. My outfits accentuated my small waist and hid everything else. I avoided pencil skirts, as well as hobble skirts, like the plague. I had more skirts than pants, as offices still prohibited women from wearing jeans and pants could only be worn on Fridays. I fit in at work and often was mistaken for a college student, but at school, I stood out from my peers. I sported the somewhat tailored blouses with bow ties paired with calf-length prairie skirts and full pleated skirts popular in the late 1980s. I was teased and bullied relentlessly. At speech tournaments, classmates wouldn't want to be seen with me and would evaporate the moment I let my guard down. College wasn't much better. I worked at an engineering firm so my wardrobe still had to do double duty. (Jeans were still off limits in the office and pants were only allowed on Fridays.) I had to purchase an entire wardrobe from scratch that would replace the daily uniform I'd worn for so long. Having to acquire clothing essentials in one season on a budget is challenging for anyone. My wardrobe was a mix of button front shirts, sweaters, floral dresses, denim skirts, prairie skirts, cords, and colored skinny jeans. Besides three polo shirts (two of which were from eighth grade), I don't remember owning tee shirts. Whenever anything happened at work or at school the first questions I was always asked were: what were you doing? What were you wearing? I quickly learned sweaters were a no no. Likewise, scooped or v-neck shirts were off limits. My skirts never more than a half an inch above my knees raced towards the floor. Color soon fled (unless it was a suit) being replaced by a neutral palette of black, grey, navy, brown, and cream. I also avoided patterns, anything that might give my presence away. There were brief "lapses in judgement" when I updated my wardrobe to include figure flattering Liz Claiborne, Jones New York, Ralph Lauren, or Petite Sophisticate separates. A red blazer. A mustard double-breasted jacket. A red silk sleeveless button front top. Billowy silk skirts in place of sturdy wool. Pencil skirts two inches above my knees. Practical loafers and oxfords were replaced with sling back wedges, platforms, and stilettos. I felt invincible. I voiced my opinion in meetings. I took risks. My career achievements have all been preceded by periods of color, moments where I felt comfortable in my clothes. I don't know whether through the clothes I was able to assume a persona of confidence, or, if because I was confident, I stepped into the spotlight with my attire. 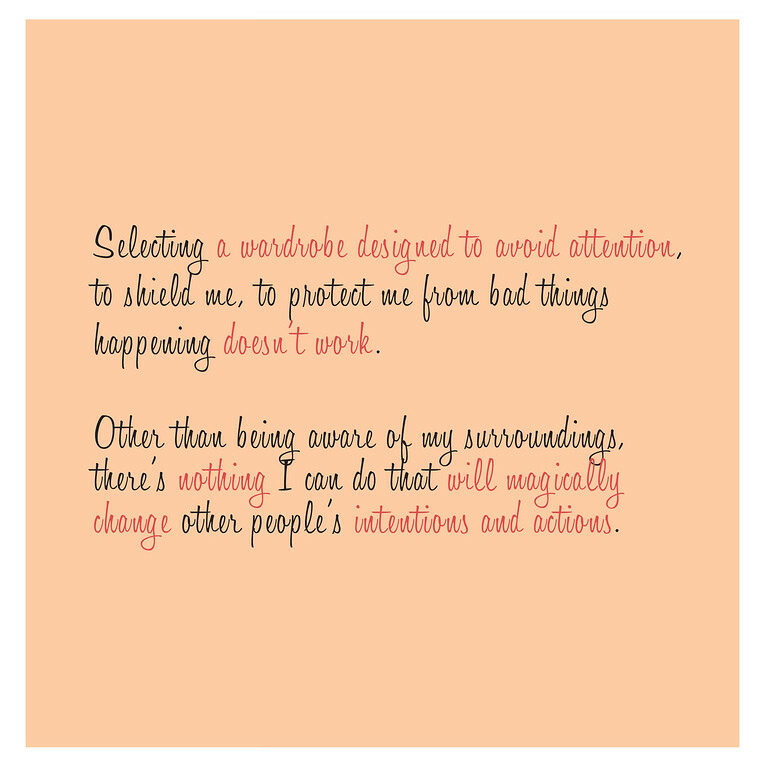 I wasn't aware of the linkage between my wardrobe and career, until I took Brene Brown's The Gifts of Imperfection eCourse. One of her activities had us find a photo where we were last "ourselves" and articulate what defined "us." We later had to chose a photo where we had been struggling and had needed a cheerleader to support us (the cheerleader being ourself, but as if we were a friend). I picked a few photos and began to realize a pattern one that involved clothes. And then I realized what now seemed obvious: selecting a wardrobe designed to avoid attention, to shield me, to protect me from bad things happening doesn't work. Other than being aware of my surroundings, there's nothing I can do that will magically change other people's intentions and actions. Has your style and wardrobe changed dramatically over your life? Have you mapped the changes to milestones in your life? When cubes was in the hospital this fall, I was torn between dressing stylishly and dressing the part of concerned wife. In movies and in TV shows, loved ones are always shown devoid of makeup and disheveled. There seems to be an unstated belief that when a loved one is ill concern for them so consumes you that you're unable to do much else. 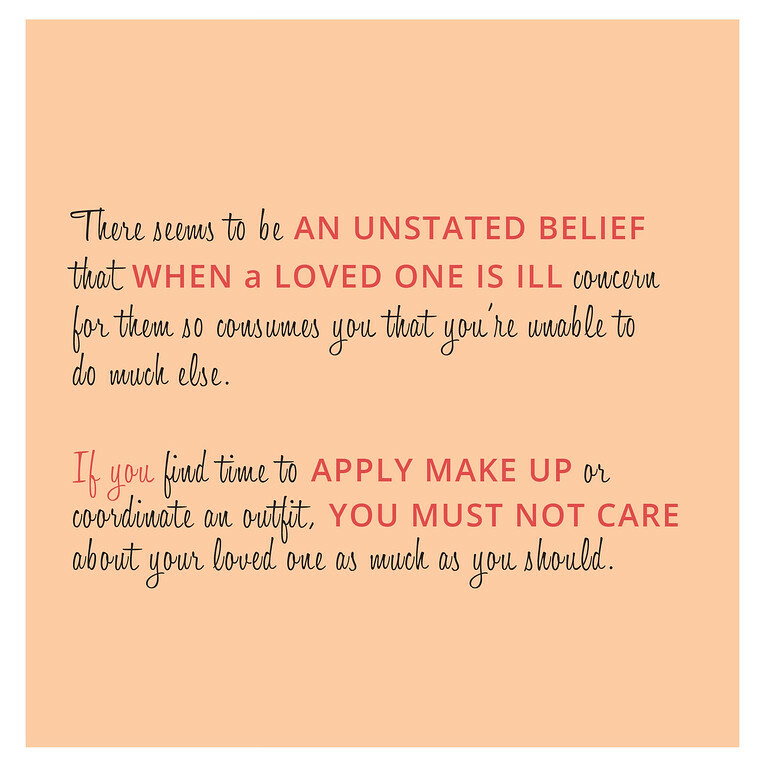 If you find time to apply makeup or coordinate an outfit, you must not care about your loved one as much as you should. After my pregnancy mid-2011 through early 2012, I can't go through a period where I "look like crap." I powered through my pregnancy on a mission to prove a direct report wrong. One day when I had appeared less put together than usual, he had expressed his concern to me that I'd be unable to do my job while I was pregnant. 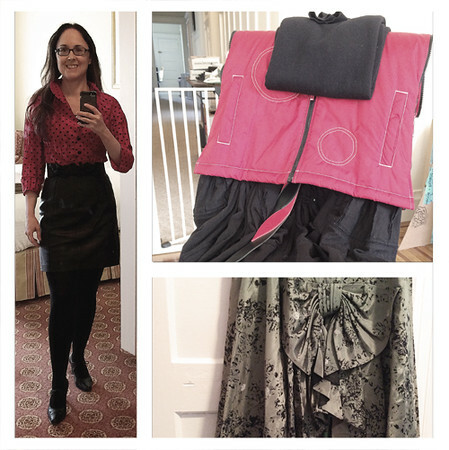 I purchased 1950s and 1960s wardrobe pieces that would allow me to keep my style while pregnant, and then drove my team relentlessly, getting marketing campaigns in place and setting up processes that would streamline operations while I was out. We produced more collateral, set up and delivered more email nurturing campaigns, and more in that eight months than we had ever done before. I was exhausted. So when cubes was in the hospital and later back home recovering, I spent time focusing on fashion. Some days what I was going to wear was the only thing getting me out of bed. Unplanned medical emergencies and the later recovery from them shake you out of your comfort zone. The Good Life you have is suddenly one you had. You need a new definition, one that until recovery is further along, changes daily, some times hourly. You're overwhelmed and barraged with decisions you have to make. It's exhausting. I knew that to be strong to support cubes and Gates I needed to reduce or to simplify decisions I had to make. Fashion was one decision that I could simplify and take pride in its completion--there was a clear beginning and an end. Hesitant at first, wondering what others would think of me publicly participating in Hilary Rushford's Style Me October Instagram challenge, I started. I even got enough courage to ask one of my friends to snap a photo of my outfit when we were waiting for cubes to come out of surgery. After changing my plans to attend Camp Mighty, I signed up for Hilary's Style and Styleability eCourse. 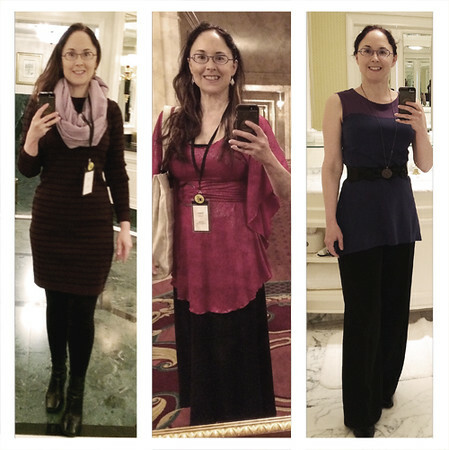 I wanted to figure out what works best for an hourglass figure, what looks were age appropriate but still remarkable, and what essentials did I need to coordinate a look consistent across corporate environments and blogging events. Tall order, huh? In a supportive environment, I played with patterns and classic 1950s and 1960s silhouettes until I could create outfits that I felt were a little outside my comfort zone, but got noticed in a good way. 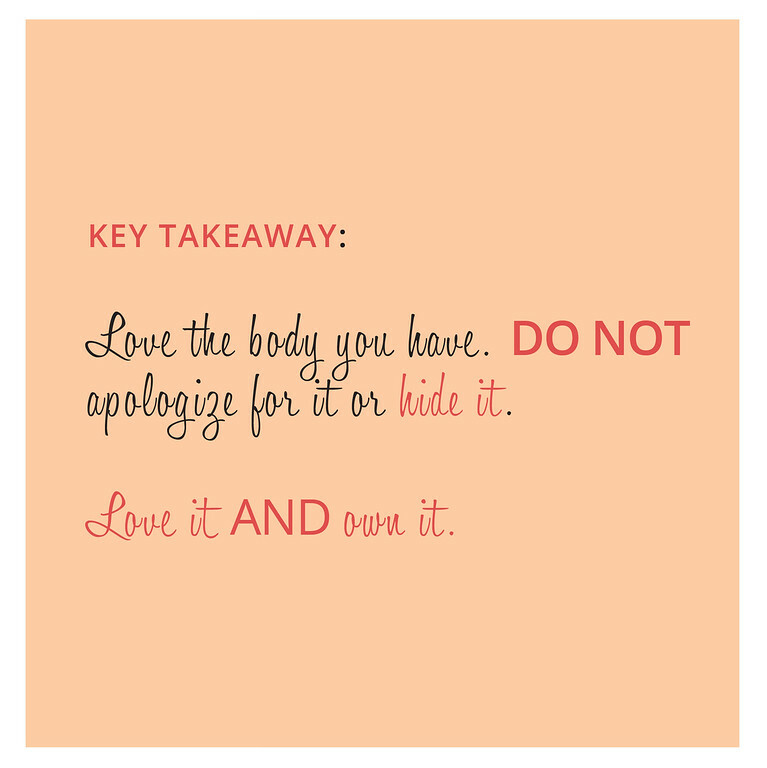 My key takeaway from Hilary's class was to love the body you have. Not apologize for it. Not hide it. Love it and own it. I almost have a Barbie doll figure: 36, 27 (24 before I had Gates), 36. I have this figure naturally without an augmentation. Over the years, I've gotten to hear and to see media messages that Barbie dolls are caricatures. That those measurements can't exist naturally. I've had neighbors accost me during Bunko nights to demand that I tell the truth and share the name of my plastic surgeon. When trying to find a corset for our wedding, I had a custom corset maker, Dark Garden, accuse me of lying after giving my measurements and let me know that it was OK to admit I'd had breast enlargement surgery. My weight has fluctuated over the years, going up to a size 14, back to a size 6, down to a size 4, and back to a size 6. In high school, I had tried to hide my hourglass shape by gaining weight. That tactic didn't stop the bullying, it just changed the focus of it. With a daughter, if I want her to grow up with a healthy body image, I need to have one myself. When you have a petite hourglass figure, it's hard to have a discussion about body image. For me to admit I haven't always liked my body is probably outlandish to some. My issues aren't the norm -- I'm not overweight and I'm not anorexic or bulimic. I've been told: You can't possibly know what it's like to hate your body; "you're so little." Your issues are "in your head." As a society, we need to expand our ideas of beauty and to remove the shame we associate with those body shapes outside "the norm." We need to acknowledge and support each other in our struggles with body image if we want future generations to have healthier body images. How did you obtain a healthy body image?